One of Israel's most famous singers Ofra Haza competed in the 1983 edition of the Eurovision Song Contest with 'Hi'. Although the song title means 'Alive' in Hebrew, it was translated into English as 'High' and into German as 'Frei'. This German version was released on the Jupiter Records label, owned by Ralph Siegel, who has written loads of songs for the Contest. The label has released many Eurovision-related singles through the years. Ofra Haza scored her biggest international hit in 1988 with 'Im nin' alu'. A sample of the track, which was originally recorded in 1984, appeared in Eric B & Rakim's hiphop track 'Paid in full' in 1987. Izhar Ashdot then remixed Ofra Haza's song, and this remix was released within months of the chart success for 'Paid in full'. As a result, Ofra Haza reached number 15 in the UK singles chart and number 27 in the Dutch Top 40. Reportedly the song sold three million copies worldwide, making it one of the first so-called 'world music' recordings to cross over to mainstream pop chart success. 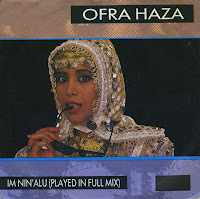 Without a doubt, the most famous track by Israeli singer Ofra Haza is 'Im nin' alu', released in 1988. But before she conquered the world with this track, she participated in the 1983 edition of the Eurovision Song Contest, representing Israel. Haza reached second place in the competition. The lyric of the song, written by Avi Toledano (who represented Israel himself in 1982 with 'Hora') states that the singer is still alive despite the 'thorns' she has endured. Later on in the song, this is revealed to be a metaphor for 'the nation of Israel' surviving various attempts at destroying it. The song had further profound meanings since it was performed on German soil with the Holocaust background and in the city of Munich, the site of the Munich massacre during the Olympic Games in 1972.